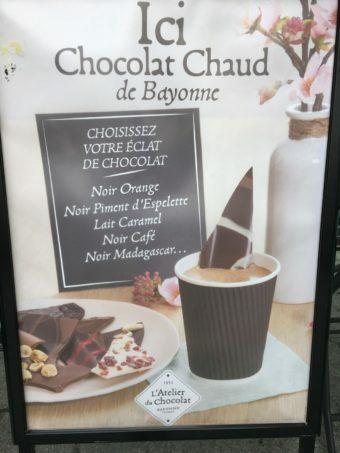 I’m not suggesting that chocolate is the only reason to visit Bayonne! 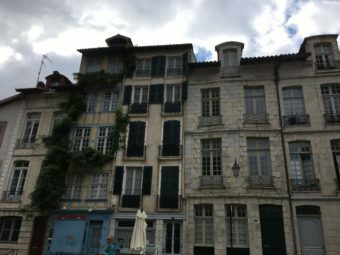 It’s a charming Basque town and we were happy to be treated to a quick tour of it on our way from Pau to Biarritz. It’s a working port at the meeting of the rivers Nive and Adour, about 8 km from Biarritz. It looks as though it hasn’t changed for decades, and that’s what I love about so many towns and villages in France. 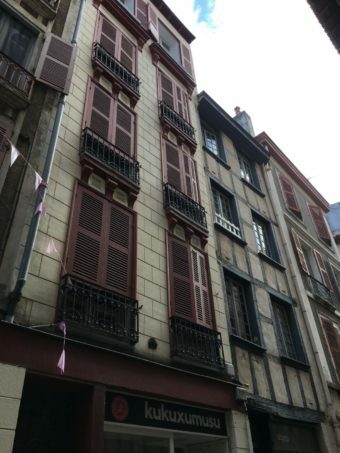 The houses in the Vieille Ville are four or five stories tall and have the typical Basque half-timbering and the Basque green or red shutters. That’s a special shade of red you don’t see anywhere else. Some of the windows have dainty wrought iron balconies, immaculately kept. The shops and many of the cafés were closed as it was a Sunday. But we didn’t need these to explore the city. 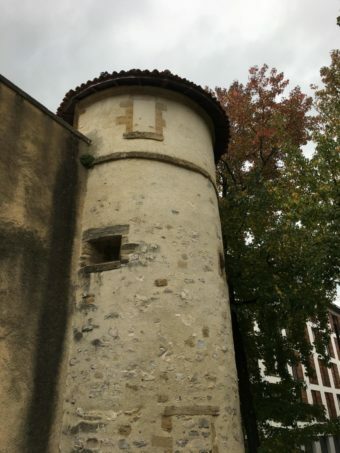 The first major building we came across was the Château Vieux, a medieval fortress built in the 11th and 12th centuries. It was built on the site of a Roman garrison, to house the governors of the city. It looks so stout and solid, as if nothing could destroy it. 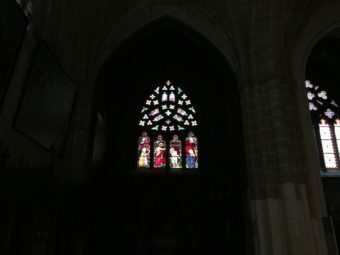 Whenever I see a medieval castle or cathedral, I wonder how it could possibly have been built with the limited equipment they had in those days. And the lack of safety regulations! One can only assume that it took many years and that some of the workers died in what was a very dangerous project. With those thick walls and hardly any windows, I wonder what it’s like inside. It’s not open to the public, so there’s no way we can find out. Unexpectedly, right next to the fortress wall, was a tennis court. 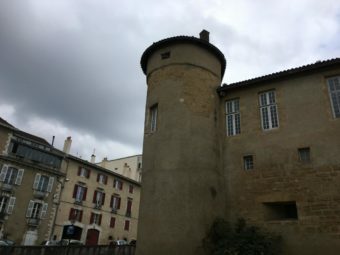 The fortress is part of everyday life in Bayonne. 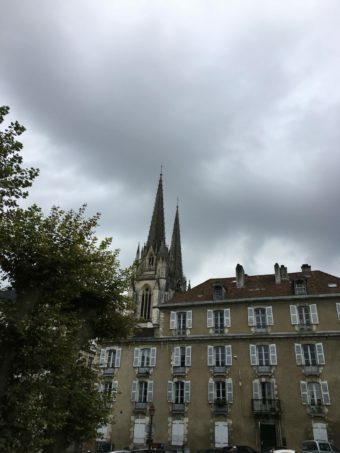 Next on our tour was the cathedral of Sainte-Marie de Bayonne, in the heart of the Vieille Ville. It dominates the town’s skyline with its twin spires – an imposing cathedral in a small town of around 46,000 inhabitants. Its elegant, pointy towers and its stone lacework bring it into contrast with the portly Château Vieux. 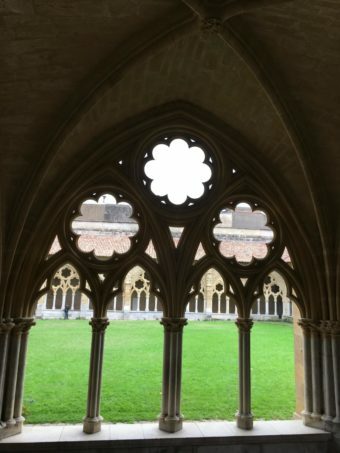 The cathedral and its adjoining cloisters – also very pretty – date back to the 13th century. We got there just as the warden was about to lock the cathedral door and go for his lunch. Our friend and guide, Jacqueline, diverted him with a bit of banter, challenging his need for lunch. This gave my daughter and me the chance to nip inside and have a quick look round. 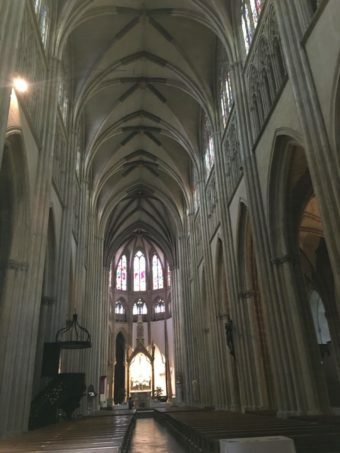 The nave is an incredibly tall, graceful vault with startling stained glass windows. There’s a calm atmosphere and no request for money. Entry is free, so the local people can enjoy the peace and beauty of this building whenever they need it. Our next stop was Cazenave, a chocolate boutique and salon du chocolat at 19, Arceaux du Port-Neuf. The pavement along this street is sheltered under a stone arcade, hence “arceaux”. As expected the shop was closed so we resorted to peering into the windows. It was then that Jacqueline explained that it was the city of Bayonne which first introduced chocolate into France. The locals were France’s first chocolate makers. That’s a little known fact. If we look at the history of chocolate, it started off as a spicy cocoa drink made by the Aztecs in the 16th century. The cocoa beans were brought over to Spain by Spanish colonists returning from South America. The drink made from the beans was very popular with the Spanish aristocracy. In the meantime, chocolate was unknown in France… until Jewish Portuguese immigrants settled here in 1609. They had escaped from the Spanish Inquisition and brought their chocolate-making trade with them. 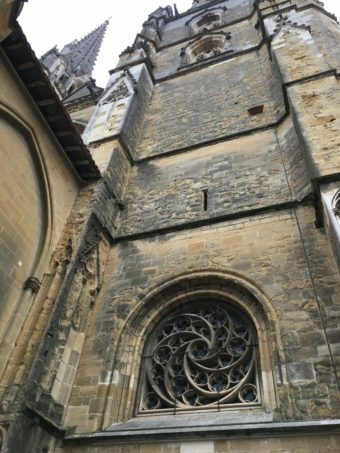 The people of Bayonne quickly picked up the craft and extended it into the surrounding Basque countryside. Eventually nearly every village had its own chocolate-making shop, just as they have bakeries nowadays. Cargoes of cacao would have been arriving regularly into the port of Bayonne from South America. 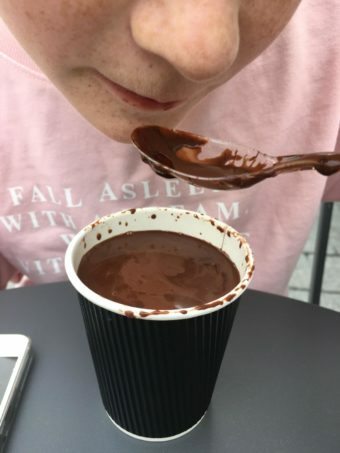 Bayonne’s original hot chocolate drink was made from dark and bitter chocolate and the sharp flavour was softened with cinnamon and sugar. The family business of Cazenave was founded in 1854. 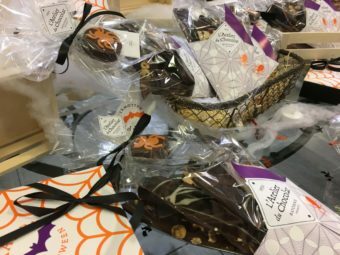 There are several specialist chocolate boutiques and salons du chocolat in Bayonne, and this one has been established the longest. 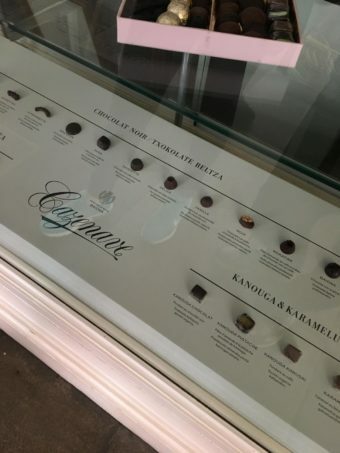 Just by looking at the display in the shop window we could see that their chocolate making is a very sophisticated skill. I like the sound of “fondant à la vanille enrobé de chocolat noir”. Each type of individual chocolate has its own intricate design and is labelled in both French and Basque. Cazenave still works with cacao in its raw form, importing beans from Venezuela, Costa Rica and Trinidad. In Bayonne the employees roast and crush the beans themselves before transforming them into something delicious. Apparently Cazenave’s speciality is a hot chocolate drink called “chocolat mousseux”. It has a frothy domed top and is based on the original 17th century drink. You can watch a video about the salon du chocolat on the Cazenave website. 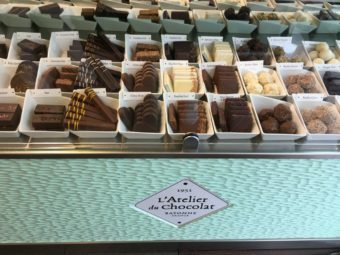 Atelier du Chocolat is another chocolate boutique in Bayonne, founded by the descendant of a local chocolate maker. This one has branched out into a franchise of 27 shops all over France. It has a stylish branch in Pau, and we love to go there. The staff are very friendly and they explain how they can make exactly your kind of hot chocolate. 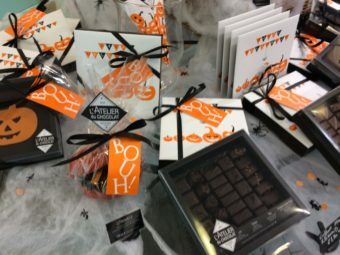 There’s a huge display of different flavoured chocolates such as caramel, orange or vanilla. You choose a chunk and they melt it into their basic hot chocolate mix. My daughter chose the ginger chocolate, which was delicious and turned out to be a meal in itself. 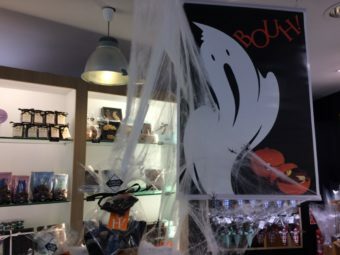 Apart from the delicious hot chocolate and the workshops on offer, there’s a vast range of chocolate goodies to choose from and the displays are lovely. Where would you start in choosing from these? 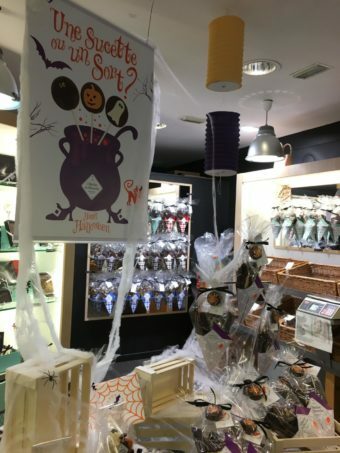 In the photos below, the boutique is all dressed up for Halloween. I was glad to see imaginative, attractive displays and none of the severed hands, skeletons, blood and bandages etc. which I’d seen in UK shop windows. And Halloween 2017, trick or treat? So, we’d explored the home of chocolate, and found out what lies behind the chocolate traditions of the Pays Basque. 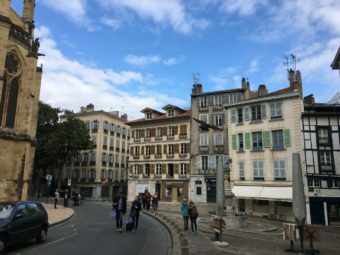 More information about Bayonne can be found on the tourist office website. Our next stop was an old favourite of mine, Biarritz, and that’s going to be my next blog post.